Weekly Photo Challenge: Spring = Happy! Spring is one of my favorite seasons! I love the transition from cold winter slumber to warm spring vibrance. Spring is not only beautiful flowers and more hours of sunshine. For me spring is a feeling…a happy feeling! When I heard the song “Happy” by Pharrell Williams, it became my new “feel good” anthem for the season. Imagine my delight when I heard the song being blasted throughout the city center on a beautiful spring day. Curiosity got the best of me and I had to investigate. What I found next was quite comical…there was a group of guys dressed in bunny suits. I’m thinking to myself either this is really weird or there is a great story behind this. 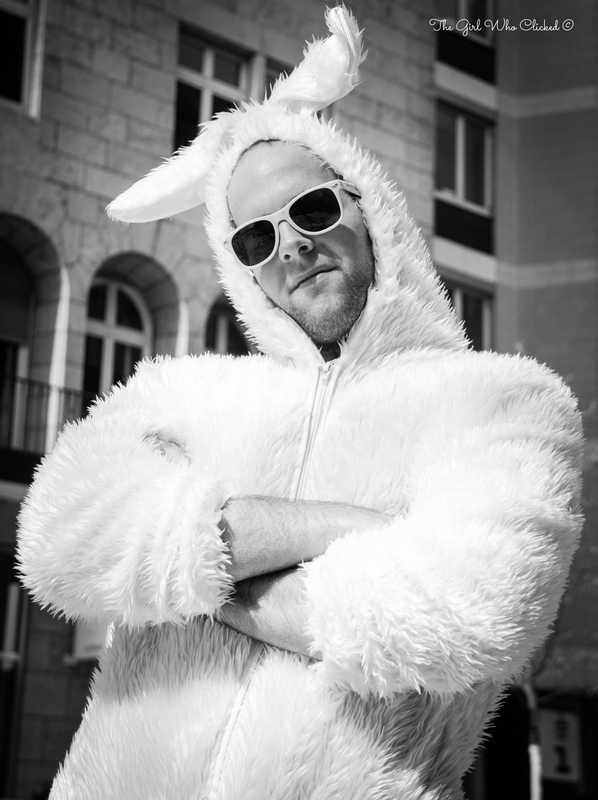 I spoke to one of the guy bunnies and it turns out that this group, Follow The White Rabbits (hence the bunny suits), were creating our city’s version of the “Happy” video. They had music, a film maker and most of all, the talented citizens who volunteered to dance in the video. The group is in the process of editing seven hours of footage and I can’t wait to see the end results! In the meantime check out the original video here. Also you can see other springy posts for this week’s challenge by clicking here! Thanks Jenn! I was happy that I had my camera with me. Hilarious shot! And great light, too, with the bunny illuminated by spring sunshine. Thanks Kiki! It was one photo op I couldn’t miss.